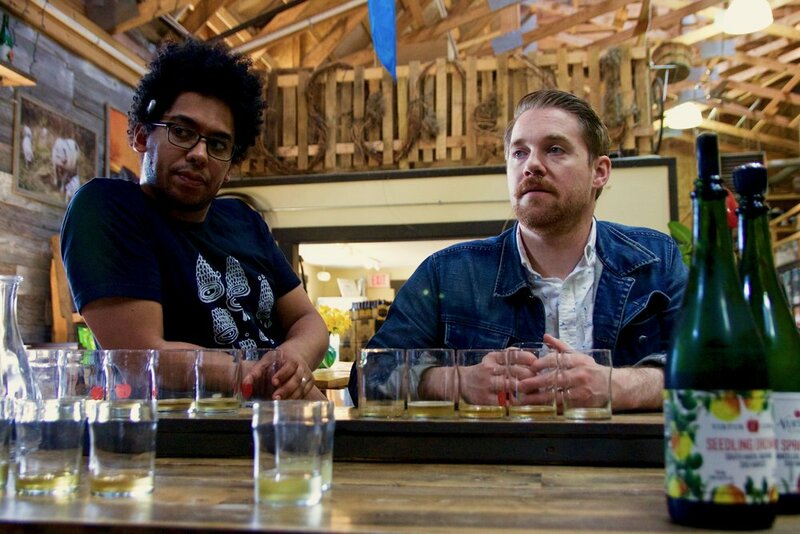 Earlier this spring, our friends from Chicago restaurant Longman & Eagle met us in Fennville to create a new Blenders Guild cider that brought back memories of bands that never existed (but should have!). Head cidermaker Seth Boeve met with bar director Chad Hauge and bar manager Tony Correale for a blending session. Head cidermaker Seth Boeve presents a thorough tasting of ciders from our cellar to find characteristics that Chad and Tony want in the final cider. The Longman & Eagle bar team: Tony Correale, bar manager, and Chad Hauge, bar director, feel out the Virtue Cider cellar for ideas. Seth, Tony, and Chad taste through samples from our cellar and barrels to find the right blend for Garage Core. Seth pulls cider from a sample bottle to blend the right ratio of flavors for Garage Core. Seth walked them through the ciders we currently had on tap in the Tasting Room to get a feel for the direction they wanted the cider to go. "When Chad and Tony came out I really let them take the reins on this one," Seth says. 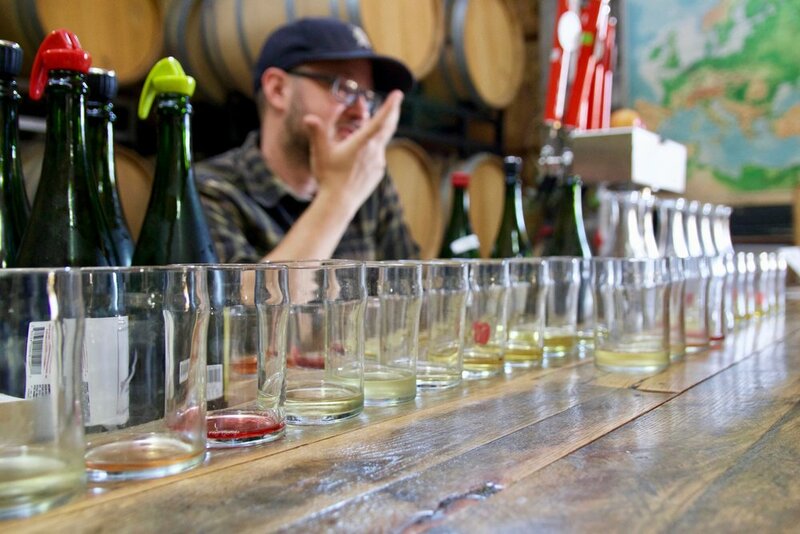 "When they got here we did a tasting and talked about the different characteristics of cider. They chose a few ciders that had interesting things to build on, and then we went into Cider House 2 where I had previously staged all the the samples I had pulled." The group played around with different ratios of different cider samples, balancing tart, dry, funky flavors to come up with a blend that fit the idea. 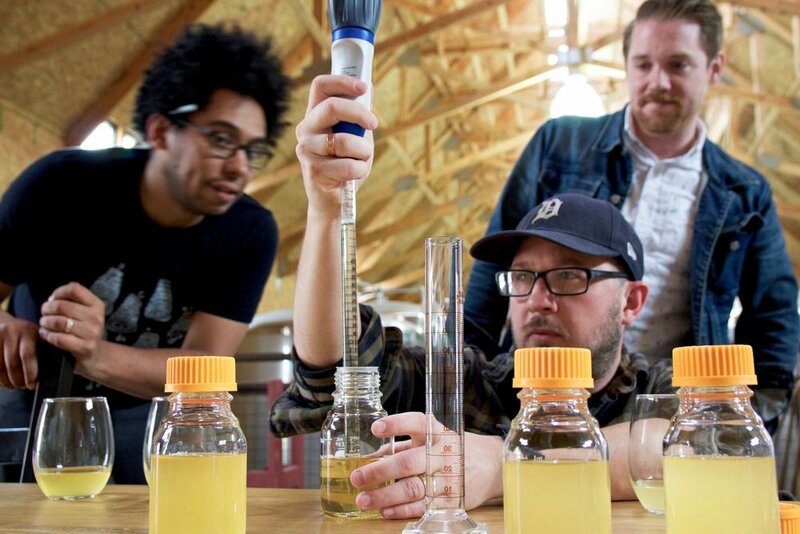 The resulting cider became Garage Core: a natural, unfiltered, uncarbonated cider that's both a 'lil funky and a 'lil tart -- and easy-drinking at 5% ABV. Lower your glass, fill it up from a distance with extended arms, then raise it back up and cheers with us to L&E’s new beloved collaboration with Virtue -- Garage Core! Longman & Eagle is hosting a Garage Core release party this Sunday, June 4 from 1-4pm. The collab cider and a special food menu will be available. Garage Core will be on draft at L&E until it runs out, and limited 765mL bottles will be available for purchase in our Bottle Shop in Fennville.